USA – Floride - In July of 1715, a fleet of 11 spanish ships departed from Havana, Cuba. A hurricane struck on July 31, and all the ships sank. 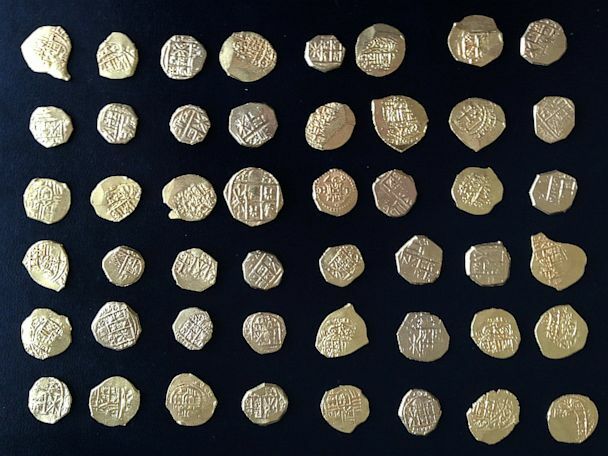 Fast forward 300 years, and 48 gold coins from the fleet have been discovered off the Florida coast. Brent Brisben, who owns the shipwreck salvage company 1715 Fleet – Queens Jewels LLC, discovered the coins with a four-member crew as part of his excavation quest Saturday. A half hour into their quest, the crew was only 100 feet away from the shore when they discovered the coins. Brisben’s company is responsible for salvaging items from the shipwrecks. He said six of the 11 ships have been discovered. Brisben is estimating the value of the coins at $250,000, but says his archaeologist has to come in and provide the full value. He estimated that each coin is worth $4,000 to $5,000. The oldest one dates back to 1697, and the newest one 1714, he said. Brisben plans to sell the coins to collectors. But he said Florida is entitled to 20 percent of the haul, and he needs to see what they want to take. CUBA – - A project to catalogue Cuba’s pre-Columbian archaeological sites has pinpointed the locations of more than 3,200 indigenous settlements. The initiative, which was launched two years ago and is set to conclude by the end of 2013, has identified 1,000 previously unlisted sites. The initiative, which was launched two years ago and is set to conclude by the end of 2013, has identified 1,000 previously unlisted sites. Cuba’s westernmost province, Pinar del Rio, and the central region of Villa Clara have the highest density of sites, with 500 each. The census aims to provide a snapshot of the locations and state of preservation of spots where the island’s indigenous people lived, the chief archaeologist at the Cuban institute of Anthropology, Alfonso Cordova Medina, told Granma. Researchers and scholars will use the information to compile the first indigenous archaeological atlas of Cuba. 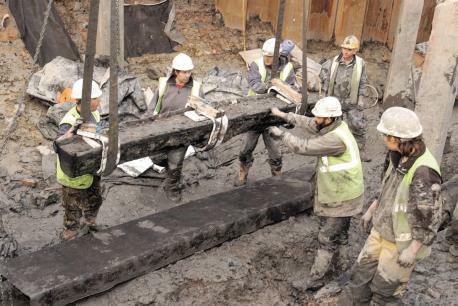 ROYAUME UNI – Newport - The director of the Council for British Archaeology says Newport’s medieval ship could benefit the city in the same way the Mary Rose has done for Portsmouth. Dr Mike Heyworth said: “The conservation work is not far away from completion. The Newport ship was found during construction of the Riverfront Theatre and Gallery in 2002. It dates back to around 1450 and is thought to have been built in the Basque area of Spain before being moored on the banks of the River Usk. INDE – Ahmedabad - For a 391-year-old, steeped in history, Moti Shahi Palace, perhaps, deserved a little more respect. Today, the Ahmedabad palace that inspired Tagore’s short story Kshudita Pashan (Hungry Stones) is a structure hemmed in by renovations that heritage activists say are “obscene”. The extensions, which include elevator shafts and galleries, have come up on three sides, prompting at least one activist to say that a “cage has been made out of a monument”. Strictly speaking, the palace that Shah Jahan built in 1622, some 30 years before he dedicated the Taj Mahal to his late wife Mumtaz, is not a protected monument under the Archaeological Survey of India Act. That shield disappeared in 1961. The newly formed state of Gujarat needed a Raj Bhavan and the two-storey palace, on the banks of the Sabarmati, was “delisted” as a national monument. 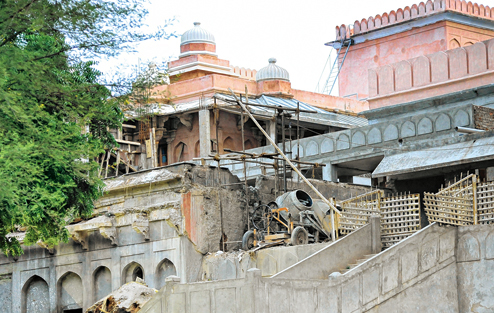 While that did not trigger the makeover, the renovations couldn’t have taken place had the structure — the only full-fledged Mughal palace in western India with a durbar hall and octagonal rooms — been still listed as a monument. GRECE – Eleusis - The green light has been given for the enhancement project of the Telesterion (“Initiation Hall”) in the archaeological site of Eleusis. The project includes the following aims: preliminary works, topographic and architectural mapping, full documentation of the current state of the monument, archaeological-architectural documentation, and submission of proposals about its protection and the enhancement of the Telesterion area. In particular, the surrounding area of the Telesterion will be cleaned, an archaeological survey will be carried out during the first three months of the project, the current state of the Telesterion area will be documented and digitized, ortho-images of the current state of the monument will be taken during the first month of the project, and a series of ortho-images will be taken after the removal of the scattered members. The 200 scattered architectural members will be moved during the second and third month of the project, while part of them will be documented and photographed. Also, rescue interventions will be carried out on walls and figurines, and rock samples will be collected from the rockmass. The damages of the monument will be recorded and evaluated to specify the type of necessary rescue interventions.